The latest group of University of Vermont (UVM) students returned from their November break trip to the Dominican Republic with a long list of accomplishments, and a still longer list of new found friends. The group worked with the community of Batey Libertad to accomplish many projects, including building a bathroom for the community center and health clinic, freshening-up the community center with a new coat of paint, fixing a community shower, and repairing a stinky latrine. Thirteen students and UVM faculty Pat and Jon Erickson also coordinated a community health clinic, hosted the 7th Annual Soccer Tournament of the Batey Libertad Coalition, brought two buses full of smiling faces to the beach for the day (despite the rain! 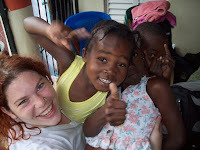 ), participated in a vodou presentation, and had quite a dance party during one of the home-stay evenings. 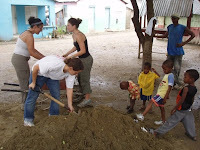 The fundraisers leading up to the trip also supported a bed project of the Las Madres de la Iglesia women’s group — raising enough money to buy 6 beds for batey residents in need — and the immigration project of the Famn Vayan women’s group — purchasing candles to earn money for passports and visas for Haitian women to live and work legally in the DR. The group was also successful in obtaining a visa for Emely (aka Negrita) to come back to the U.S. with for her ear surgery later this month. In between days at Batey Libertad they managed to visit Santiago, Puerto Plata, Cabarete, the community of Saman, and the border town of Dajabon … with lots of coughs, stomach aches, and fevers thrown in with the rain just to spice things up a bit. If you’re interested in learning more about travel-study opportunities to the DR, please join this semester’s class on Tuesday, December 9th in 105 Aiken on the UVM campus as we share some trip experiences and final reflections from a busy couple weeks in Hispaniola. Students from upcoming travel study courses to the DR in January and March will be in attendance as we pass the service-learning baton. If you’re interested in learning more about our yearly trips and ongoing projects in health education, community gardening, Spanish literacy, and community development then please don’t miss this opportunity to connect with students and faculty from past, current, and future trips. Entry filed under: Batey Libertad, University of Vermont.